If you upgrade from Xepg 0.6.x.x it is a MUST to read the changelog. Many thanks for your great and valuable tool - it's an important chain member in my media center! The reason is easy: Xepg no longer accepts a pretty-print formatted EPGFormat XML file, i.e. it doesn't like line breaks in the EPG format XML file. So, you have manually edited the EPG Format file, right? 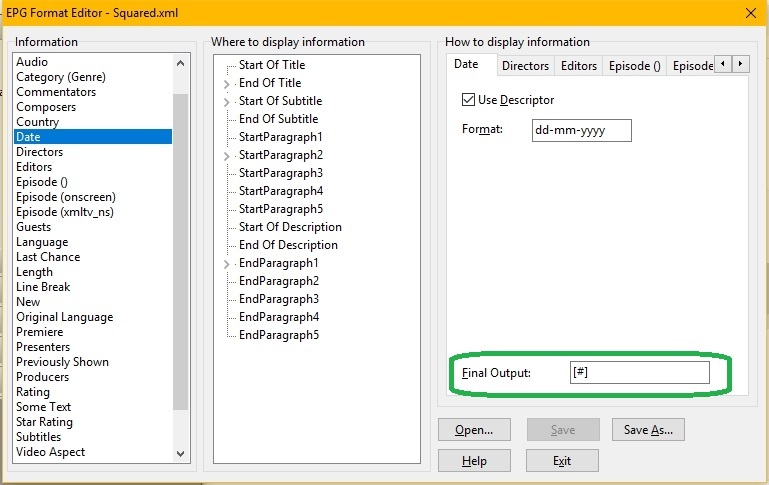 I use Microsoft MSXML DOM (TXMLDocument in Delphi) to read and write the file. If that fails, the file is with 99,9999% probability not well-formed (illegal). Try to open the file in Internet Explorer. First of all: Nope, there's no need for manual changes, reformatting Default.xml is enough and XML is still well-formatted, IE opens it without complains. I suggest to leave things as is. CONCLUSION: Don't edit xml files created by Xepg. The extra code line for preserving whitespace was introduced in version 0.5.2.0. An unwanted side effect was that pretty-print xml is no longer accepted in settings files. It is accepted in the XMLTV files ofcourse. Xepg (TXMLDocument) never creates pretty-print xml files. You MUST have edited the file somehow, sometime in the past. Well, never mind. I do not like that Xepg cannot read an xml file that is actually valid. It's not that easy to fix, unless preserving whitespace is turned off again. Or: use another xml parser like OXml/EasyXml. For now I will leave it as is. In fact, there's no need to format / edit the EPG format file - if one knows. I can't remember why I then reformatted it (it has been working fine at this time), but I guess I was just curious to see how it's structured. No problem for me if you leave it as is, but maybe the error message could be improved, indicating that the format file can't be parsed, not the xmltv file, as I thought for a while. This is allready on my TODO list. Whatever I decide to do, a more meaningfull error message is needed in any case. Thanks again for the feedback, it was usefull. Hello, I set up xepg, pair my channels, and then download and import the epg into DVBViewer. annoying as my epg provider only offers a 3day epg so I need to repair channels every 3 days. The 2310.honeybee.it is an XMLTV ID. Those should be the same between downloads. Try to check this out as a first attempt. The XMLTV IDs MUST be the same between downloads. 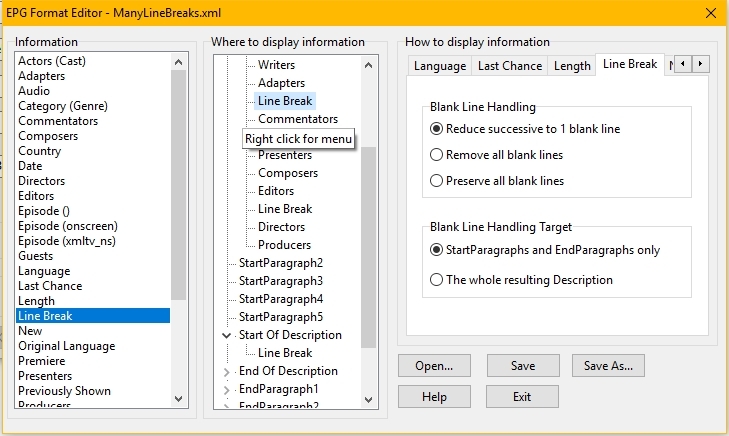 Fixed an error and added the option for inserting line breaks in the EPG Format Editor. Details in the changelog. Fix: Forgot to UTF-8 encode the .LOG files created in invisible mode. To upgrade: just replace the XgrabDMS.exe with the new one in your installation. Fix: Too many blank lines in the output in some cases. Details in the changelog. Is there any way to backup and restore the pairings?. I need to reinstall my OS soon and ive had to remap everything from scratch every time i reinstall the system. Yes, click link Xepg Data Folder in Xepg main window. Read the text file TheFiles.rtf for a description. The pairings are in the Pairings.xml and Config.ini is the Xepg settings. I'm running DVBViewer and media server 2.0.3.0. I'm not sure if this started after i upgraded to the latest version. I'm not getting any channels returned to Xepg from DVBViewer. Its launched when I run the pairing but no channels at all are shown in the right hand pane of the pairing window (all channels from the epg file are correctly shown in left hand pane). Although they all show in DVBViewer itself. Its launched when I run the pairing but no channels at all are shown in the right hand pane of the pairing window (all channels from the epg file are correctly shown in left hand pane). Although they all show in DVBViewer itself. I have no idea of what is happening, sorry. Works fine here with the TS streams delivered by the DVBViewer installation. If you PM me some m3u/ini I maybe can check it out. I am facing similar issue where only some iptv ts stream are visible in xepg. Change from the old IPTV device to TS streaming. See the description from Delphi. So I did that ..
That's normal for "TS Stream" channels if only the URL is known. The DVBViewer channel auto-update detects the remaining data on first tuning. However, since the TS Stream EPG channel ID is not based on PIDs, but on a URL hash value, assigning EPG data should work regardeless of the PID state. This also applies to other kinds of streaming that the TS Stream framework can handle, e.g. HTTP Internet TV and Radio. 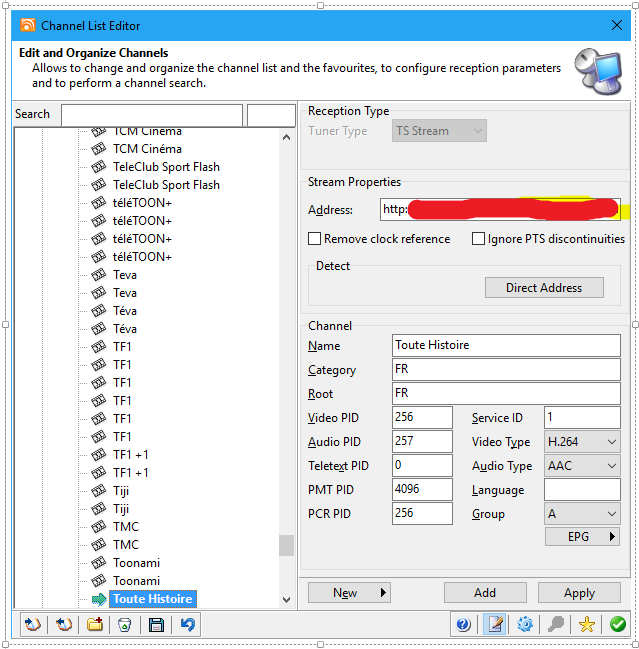 If you want to give it a try please read here at the beginning ("Added: Channel List") how you can load ready-made channel lists containing free TV and radio channels that are broadcasting over the internet. You may also use New -> TS Stream in the Channel Editor to enter additional URLs. I have a XMLTV file that provides pictures for some series and movies by the <icon> flag. Would it be possible, to implement a function in Xepg to import these pictures in DVBViewer? If the category in my XMLTV file is titled as (i.e.) "Movie/Drama", I mean EIT conform, have I still to use Xtranslate, or does this recognize Xepg? So, the iconurl is imported if present. You will need to convince the developers of DVBViewer/DMS/RS to actually use it. If the category has an English lang attribute (<category lang="en">Drama</category>) it should be recognized if it confirms to the ETSI 300 468 standard. Xepg always loads the English.xml language file. Several years ago I contacted the XMLTV community with a request for supporting the integer version of category (<content> in the upper xml file) and got a clear answer: No. It is in general not an easy task to convert text (can be anything) to a well defined number. The only way for now is manipulating the language file. There was a tool named "EPGImporter" for DVBViewer. This tool could provide pictures to show up in DVBViewer. There should be a way already. I'll try to get some more informations about this. I know know the "EPGImporter". It reqiures a special very old OSD. If I remember right it downloads all the pictures to a folder naming them using the old 32 bit channel identifiers and the EventID. 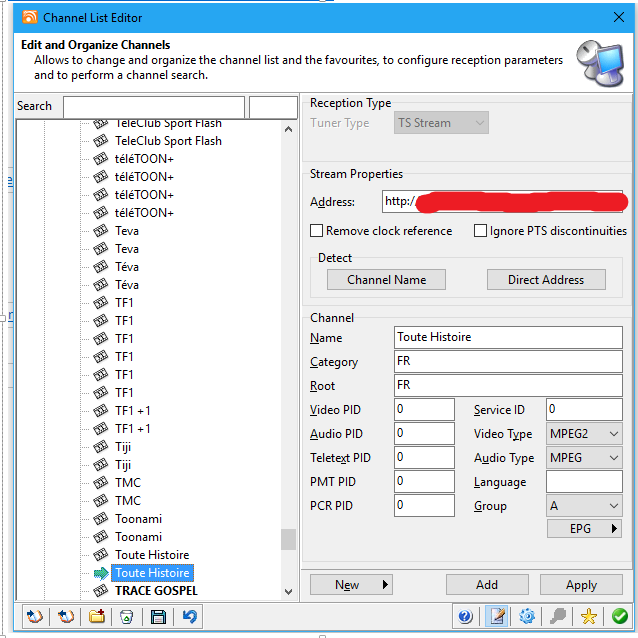 Today 64 bit channel identifiers are used. It won't work with the DMS/RS. Unless special measures for supporting this are taken by the DVBVewer/DMS developers it will not be supported by Xepg. The subject has been discussed several times before in the Xepg thread. I am not able to supply a link since the (very long) old Xepg thread was somehow deleted when implementing the new forum. I think the developers mainly discarded this idea because of EPG.dat is a binary file not supporting urls and the fact that implementing it in the DMS would require quite a skillful web designer (there is close to none webinterface development at the moment...nobody knows how or dont wanna do it for free). Funny thing is I have series/movie posters, fetched from my XMLTV (imdb posters), working with my own developed software, but this is entirely GUI based. @nexusle sent me a PM over at the Kodi forum asking if support for XMLTV might be possible. I declined this specific request, however the DMS API provides support for loading media/images from the server (medialist and sideload API endpoint). So if you could extend your addon to fetch and store epg (icon) images in a userspecific directory, I can extend my PVR and sideload them. To minimize http calls to the DMS I would suggest a filename pattern like <channel_id>_<epg_id>.png (or jpg). This way I can fetch the images per channel. If I remember that correctly, this is more or less the way the EPG image support is handled in the DVBViewer. It looks for images stored as [configuration folder]\images\ServiceID-EventID.jpg for every EPG entry. But if you are planning to support this better ask @Griga if this is still a good format or if we should change the image name format. Because it was introduced in 2005 and only used by few people in connection with the EPGImporter. You mean <event_id>_<epg_id>.png, right? The images in question are <programme> specific. For XMLTV the event_id is the 32 bit integer start time of a <programme> tag. I would consider doing such a thing if the web-interface/DVBViewer will support it (currently they don't). However, I don't like this approach since a lot of pictures are downloaded and most of them are probably never viewed. Furthermore the pics get outdated: a regulary clean up is needed. The most logical thing to do would be to include the links into the epg (epg.dat). The epg.html api should then deliver them if present of course. Yeah, that would work as well. DMS API supports searching with wildcards, so both <event_id>_<epg_id>.png or <epg_id>_<event_id>.png would be ok. I would put the epg_id first for better file sorting support. Extending the epg.dat is probably out of scope. One possibility without any breakage would be to add support for storing arbitrary properties for epg entries. Extension authors could then agree on known properties and add support for them. However I don't know if @Griga would be willing to add this + it would make epg listing (a lot?) slower as you need to lookup properties for every epg entry. I would guess that this requires many changes in the DMS code (not known to me), and where should the values be stored if not in epg.dat? Well, ask Griga. For all types of information (except "Line Break" and "Some Text") you can give the output a final personal touch. In the upper example square brackets will be put around the "Date". Details in the changelog and the help file. Is it possible in Xepg to make content that based on xmltv file appears in DVBViewer's EPG's Description column to appear instead in Title column? While EPG Format Editor provides other customization options, I couldn't find a way to do this. Of course, it is possible to achieve the same by creating xmltv that by default puts the content in question to Title column (or "subedit" as it is known in xmltv). However, for my use it'd be better to do this customization in Xepg. The reason is that it'd enable using WebGrab+Plus's standard siteini files without having to modify them each time they're updated. This is a bug in the DVBViewer user interface. The Title and Event column names should be switched. Maybe you can convince @Griga to do that. I've wondered about that too, but that's actually not what I meant now. I'm using a WebGrab+Plus siteini file that makes certain content to appear in DVBViewer in Description column (after the xmltv file is processed by Xepg). I'd like that content to instead appear in Title column in DVBViewer. I'm aware that I can achieve that by modifying the siteini file, but that's not optimal as then I need modify it again each time it is updated by its author. That's why it'd be nice if there was an option in Xepg that allowed such customization (assuming it is not possible already). This is a bug in the DVBViewer user interface. The Title and Event column names should be switched. and that can't be changed without causing compatibility issues. So if you apply the language file correction above, consistency with the file name scheme gets broken. 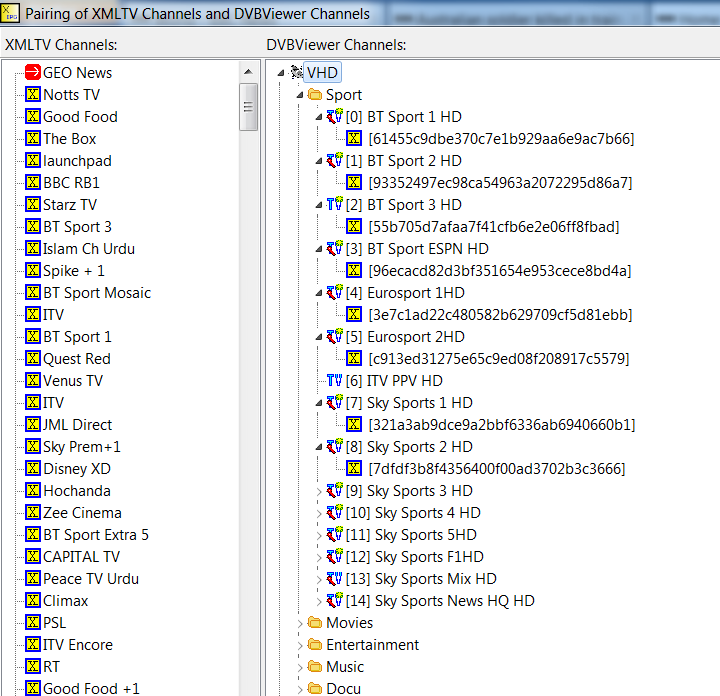 Anyway, the naming of "Title" and "Event" in DVBViewer is very chaotic throughout. E.g. in the Timer Recordings window the Event (that should rather be named Title) appears as Description which is something else in the EPG window. Regarding the identifiers in the code it's even worse. Sometimes they carry the same name as in the UI, sometimes the other way round, sometimes whatever... at some point I gave up to get it sorted consistently. ... at some point I gave up to get it sorted consistently. Yes, I indeed spent quite some time with the Help function. There are many specific variables available in EPG Format Editor, but as far as I can see, there is no option to enable what I wrote. There don't seem to be separate items for what WebGrab+Plus calls "subtitle" (DVBViewer: Title) and "description" (DVBViewer: Description) in EPG Format Editor's Information column. It seems to me that to be able to do what I want would require being able to move items that appear in "Where to display information" column (or alternatively having separate items for "subtitle" and "description" in Information column -- not sure which would be more logical), but I can't see any arrow buttons to enable that. It is possible that I don't properly understand how EPG Format Editor works as this seems something that would be useful to be able to do. If I indeed misunderstand something, do you have any pointers to get me in the right direction? 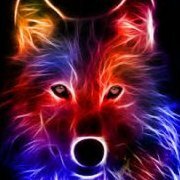 Ich habe eine Konfiguration im Media Server mit 4 DVBC Kabeltunern (Uinitymedia) und 2 IPTV Tunern (Entertain). Da die Entertain Kanäle kein EPG haben, benutze ich Xepg zusammen mit XGrepDMS um die EPG Infos von DVBC abzugreifen und in Xepg mit den Entertain Kanälen zu mappen. Das klappt auch, bis auf eine Sache, die ich nicht verstehe. Wenn ich die Pairing Funktion in Xepg aufrufe, werden nicht alle Entertain Kanäle aus DVBViewer übernommen. Bild1 in der Anlage zeigt die Kanäle in DVBViewer, Bild 2 die Kanäle in Xepg. Man sieht, dass einige Kanäle fehlen (z. B. MDR...). Folgerichig haben diese in DVBViewer dann auch kein EPG. Die Logging Meldung beim Importieren der Kanäle habe ich in Xepg.txt angefügt. Das passt irgendwie, es fehlen mir genau 8 Kanäle in Entertain. Allerdings verstehe ich nicht, warum das so ist. ich hoffe doch das hier viele XEPG und XTranslate nutzen um den DVBViewer mit EPG Daten zu füttern. Zumindest XEPG habe ich schon am laufen soweit so gut. Nun geht es an die Feineinstellungen. Ich nutze Kisscon oder EPG Buddy für die Erstellung der EPG XML Datei, das wäre die Quelle, funktioniert soweit. XEPG habe ich auch soweit eingerichtet, von 1-5. Epg wird aus der xml geladen und auf die gemappten Sender vom DVBV eingepflegt, die Automation läuft auch. So nun geht es ans Feintuning. XEPG :: Das ganze sieht im RS so aus wie auf dem Screen, leider in falscher Reihenfolge. Gibt es hier eine Möglichkeit, das ganze mit XEPG zu formatieren, damit ich bestimmen kann was wo steht, z.B. Erste Genre, dann die Beschreibung zum Schluss, Besetzung usw. Wenn das geht weiß ich nicht wie. Ich nutze den RS als Backend der auf meinem Server läuft, dort greift der Client (Kodi) drauf zu, nun gibt es in Kodi ja Genre Farben in der EPG Ansicht, diese würde ich nun gerne Einstellen, das heißt ich muss erst mal mit XTranslate die passenden Genre zu einander mappen, damit die Farben ansprechen, soweit bin ich schon, aber hier hört es auch schon auf. Ich weiß nicht wie XTranslate funktioniert und was ich genau machen muss, damit ich die Genre aus der xml Datei passend mappe, damit es in Kodi mit den Farben passt. die Internet-TV-Fähigkeiten des DVBViewer Pro 6.0 ist super - und weckt so manche Begehrlichkeit. Für mich das EPG, welches Grundlage für Seh-Entscheidungen und Aufnahmen ist. Nun hab ich auch schon im Forum über Webgrab +, XEPG und EPG-Buddy gelesen und auch gesucht, finde aber leider nur englische Hinweise, was das Ganze nicht ganz so einfach macht. Deshalb wollte ich anfragen, ob mir jemand (auf Deutsch) die Arbeitsschritte erläutern kann, damit ich auch bei den Stream-Sendern mein geliebtes EPG genießen kann. Wäre eine große Hilfe für mich.
bin etwas ratlos ... ich möchte gerne, mein. EPG erweitern, da gerade bei Serien Staffel + Folge für mich sehr entscheidend ist. Ideal wäre langfristig ein mischen von DVB Stream und extern, aber momentan würde mir Extern als erste Schritt schonmal reichen. Ich bin soweit, dass ich per Webgrabplus mir eine XML erstellen lasse und diese dann per xepg in DVBViewer/DMS übertrage. Das klappt. Aber leider alles nur Manuell. Also graben manuell und einfügen auch. Das hätte ich gerne automatisiert ? Wie ich EPGDATA.COM reinbekomme, habe ich noch gar nicht hinbekommen. zwar liefert epgdata.com eine xml, darin scheint xepg aber keine channels zu finden zum pairen. Hello, I was using xepg with xmltv.co.uk but there xml files are all dead now. How can I get DVBViewer to grab EPG data on it's own again? ?